A team of researchers from MIPT and their German and Japanese colleagues have designed a numerical model of the annual water cycle in the Martian atmosphere. Previously, the scientists focused their research on relatively large airborne dust particles that serve as water condensation nuclei on Mars. In this study, the MIPT team expanded the analysis to include smaller particles that are more elusive. As a result, the calculations turned out to be more accurate and consistent with the data obtained from Mars orbiters. The paper was published in the Journal of Geophysical Research: Planets. Alexander Rodin, the head of the Laboratory of Applied Infrared Spectroscopy at MIPT, comments: "Our model describes the 3-D motions of the air masses on Mars, solar and infrared radiation transfer, phase transitions of water, and the microphysics of Martian clouds, which is pivotal to the planet's hydrological circulation." There is not much water on the red planet, especially in its rarefied cold atmosphere. If we were to collect all the atmospheric water and spread it evenly on the planet's surface, the layer would be only 20 microns thick. Although water is present on Mars in such a low concentration, it has a major impact on the planet's climate. For instance, clouds scatter and re-emit incident infrared radiation, and ice condensed on aerosol particles removes dust from the atmosphere. That is why, in order to get a better understanding of the processes that take place on Mars, it is important to look into the ways in which water vapor and ice particles are transported and redistributed between the seasonal polar caps. Water on Mars was first detected as far back as 1963. Later, it was meticulously examined by a wide range of space missions: from the Mariner 9 probe to the ExoMars orbital station. One of the stations — Mars Express– has a Franco-Belgian-Russian spectrometer called SPICAM on board to study the red planet's atmosphere. Using the collected data, the scientists designed a Martian atmosphere model that was later improved and validated by numerical simulations. However, calculations do not always correspond to the actual observational data. All numerical models are based on the notion of water condensing on aerosols suspended in the atmosphere — this process underlies cloud formation. Consequently, modeling results depend greatly on the size distribution of aerosol particles, the nature of which is not yet quite clear. This distribution is generally considered to have only one peak. Nevertheless, recent observations have shown that two peaks in the distribution are also possible during certain Martian seasons. In this case, the distribution is called bimodal. The research team, led by Alexander Rodin and Paul Hartogh, designed a model of the red planet's hydrological cycle based on a bimodal size distribution of aerosol particles. To do that, the scientists used a general circulation model of the Martian atmosphere developed at Max Planck Institute, which is known as MAOAM, short for Martian Atmosphere Observation and Modeling. The reliable 3-D simulation of atmospheric circulation helped the team build a theoretical model providing a qualitative explanation of the phase transitions of water, as well as its transfer in the atmosphere. The scientists discovered that water concentration reaches its high in the North Pole when the Northern Hemisphere experiences summer. As winter approaches, the density of airborne vapor particles gradually decreases, which may mean that water condenses and falls on the planet's surface as precipitation. The calculation results are almost identical to the SPICAM map, with minor differences in the case of periods when atmospheric water concentration peaks. Moreover, the scientists used the same method to calculate the density and atmospheric distribution of clouds formed by microscopic ice crystals. It turned out that a major part of the ice was located above the equator at precisely the time when water vapor density reached its maximum in the North Pole — that is, during northern summer. 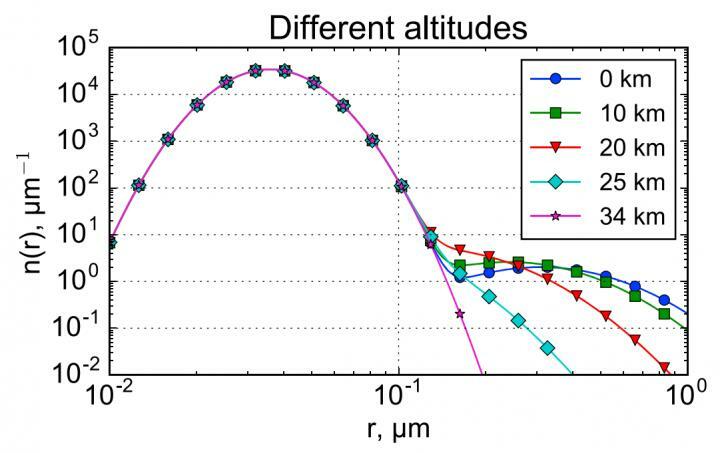 The scientists point out that the results obtained using the bimodal approach differ from those of the calculations in which the size distribution of the particles had only one peak. The bimodal modeling proved to be more accurate and in line with the experimental data. Thus, for example, monomodal calculations lower the altitude of ice clouds and diverge from the results of observations during the seasons when water vapor density reaches its maximum. Back in 2014, we featured a story about MIPT scientists studying the distribution of water vapor in the red planet's atmosphere using the data collected by the SPICAM spectrometer. In particular, they observed how vapor concentrations varied during the year. Later, the researchers launched a website dedicated to Martian atmosphere research.